How do I set up my receipt template – How can we help? UPDATE: Improvements to your Receipt Templates. We have made improvements to your Receipt templates to make it easier for you to generate customisable receipts from your Sell Screen, Sales History, Sales Ledger and Email. These improvements will be available on both Web browser and the iPad app. Vend on iPad: Improvements to receipts on Vend's iPad app will be part of the Vend iPad 3.1.0 update. For more information, click here. Customer Details: For privacy reasons, we've updated how customer details (like name and phone number) are displayed on your receipts. To include customer details, go to Setup > Outlets and Registers > Receipt Template, then adjust the setting under Customer Information. If you're based in the EU we recommend checking whether your receipt settings comply with GDPR. Updated Font: We've updated the font to ensure that your receipts print more effectively, and that they will be more durable over a longer period of time i.e. they won't fade as quickly. Other functionality: Other new functionality includes uniform receipts regardless of where they're printed from (e.g. Sales Ledger or Sales History), tax per line item, gift card and loyalty balances, total savings, and more. The article below will talk you through the improvements and how to add them to your receipt template. The enhancement to your Receipts templates is designed to make complying with tax invoice requirements easier, without cluttering up receipts. It is worth noting that there are differences between a tax invoice (whether it be GST or VAT) and a receipt. A GST or VAT tax invoice is a legal term with specific tax requirements. A receipt, on the other hand, is an acknowledgement of payment but may or may not also be a GST or VAT invoice. In a nutshell: all tax invoices are receipts, but not all receipts are tax invoices. The good news is that a lot of retail sales do not require a tax invoice to be issued. Most customers at your store will want a receipt as it is a proof of purchase and generally needed for returns. Please note: Tax invoice requirements vary by country, and you are responsible for meeting these requirements (if any). We encourage you to work with tax, legal and other professional advisers to determine exactly how the GST or VAT rules may apply to you. We will talk more about tax invoices and your requirements in a separate help centre article. 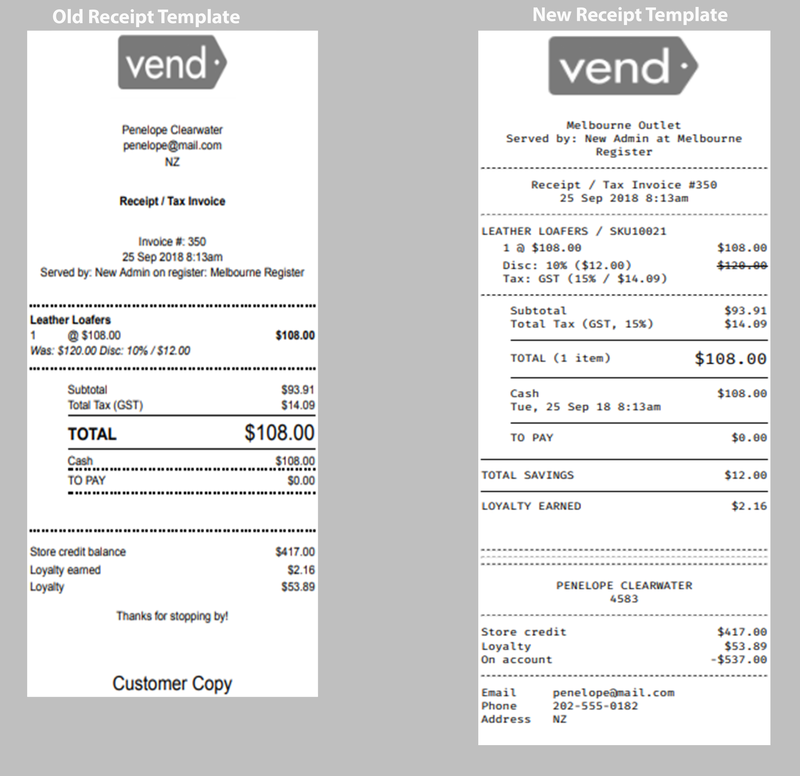 Vend uses Receipt Templates so we know what information to put on your receipt, and how to format it so that it will print nicely on your receipt printer. What type of printer you're using (Thermal or Standard). If you need help setting up your receipt hardware? Check out these articles. Company name and tax number (if required for your region). Address and other contact details for your store(s). No more than 190px wide for a portable thermal printer. No more than 290px wide for a countertop thermal printer. No more than 840px wide for a standard desktop printer. Black and white, or monochromatic for best results. Colour and greyscale images will not have great results on thermal printers. 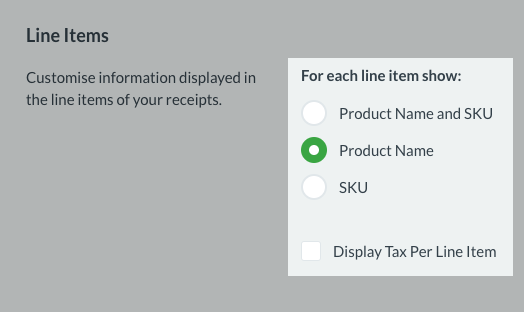 You can also edit an existing receipt by scrolling to the bottom of the Outlets and Registers page and selecting one of the templates you've already created. 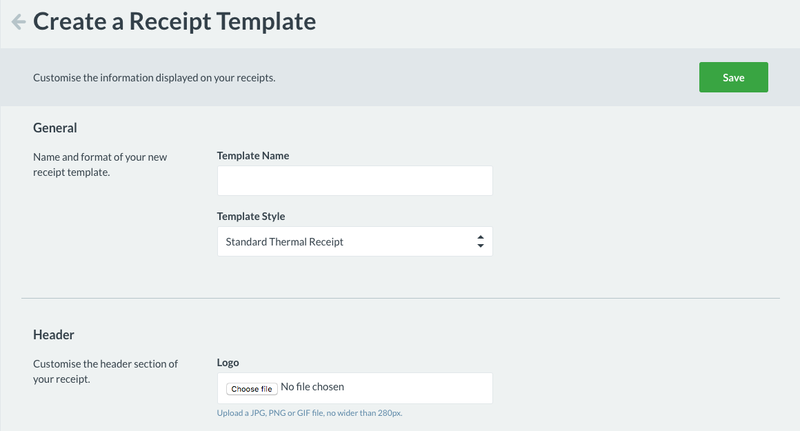 You will now be in the receipt template edit screen and can start setting up your details. 1. Under the General section, give your template a name so you can easily identify it. A standard desktop printer, choose Standard Invoice. A thermal printer, choose Standard Thermal Receipt. Tip: You can set up multiple receipt templates. If you have outlets in different countries, set up one receipt template in each country to deal with any local requirements. Multiple templates are also good in situations where you may want to issue both receipts and tax invoices. 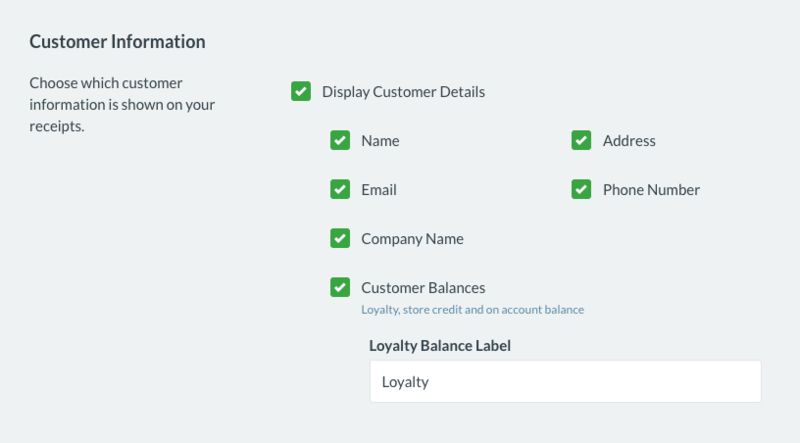 Once the framework for your receipt is set up, you can start customising the layout. Note: We have pre-populated many of the fields for you as suggestions of what you may like to include on your receipts. You do not have to make changes to these fields unless you would like to customise the fields on your receipts further. 1. In the Header section, add your company logo or custom banner image. Remember to make sure it fits the size requirements. Legal trading name and tax number (if you don't put these here, you might like to put these in the footer). 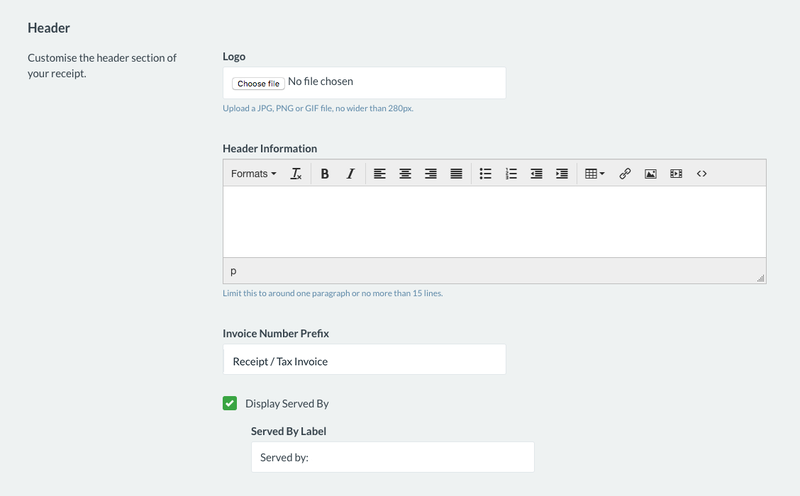 If you want the receipt to be a tax invoice, add Tax Invoice into the Header section. 3. Add your Invoice Number Prefix. 4. Next, you will be able to choose whether to Display Served By. This will display who the customer was served by in store. 5. In the Line Items section, you will be able to customise the information displayed in the line items of your receipts. It is in this section that you will also be able to Display Tax Per Line Item. Tip: Display Tax Per Line Item is required in some jurisdictions as per their local law. Please check if this is a requirement in your jurisdiction. 6. In the Totals section, you will be able to customise the labels for the total values on your receipts. 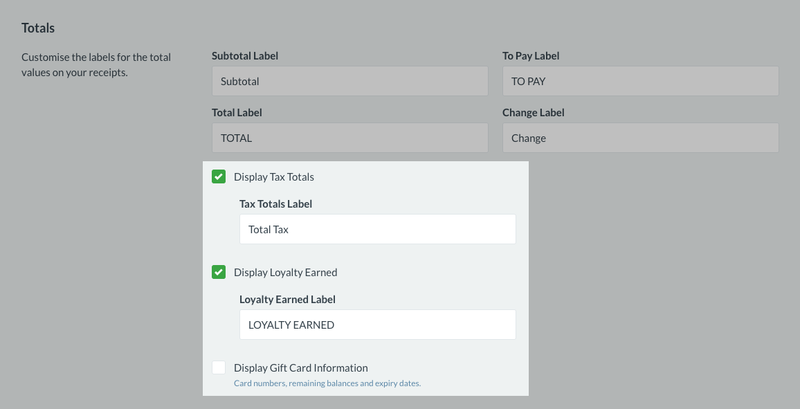 In this section you will also be able to choose whether, to Display Tax Totals, Display Loyalty Earned, Display Gift Card Information. 7. In the Customer Information section, by ticking Display Customer Details, you will be able to customise how much customer information you would like to display on your receipts. 8. Finally, in the Footer section, you will be able to add additional information in your Footer, for example, a Thanks for stopping by! In this section, you can also choose to Display Barcode. This will turn the receipt number into a barcode which is printed on the receipt so you can scan to quickly locate the sale if the customer returns to your store. Receipt barcodes are useful if you run a service business, like a dry cleaner or a tailor, or if you have a lot of customers using layaway and account sales. You can also Display Loyalty Message which encourages customers to register in your store's Loyalty program. 9. Once you have added all the necessary information to your receipt template, scroll to the top of your screen and click Save. The final step is assigning a receipt template to your outlet and register. 1. Click on Edit Register on your Outlets and Registers page. 2. Under Receipts, select which Receipt template you want to use. 3. You may also choose what actions to take at the end of a sale including Emailing receipt or Asking for a note on certain types of sales. Your receipt will now be available for you to assign to an outlet and use for printing. For more information on how to issue your customer receipts in store, check out this article here.